Professional pastry chefs and bakeries bake on aluminum sheets for perfect results. You can too, with our commercial quality naturals bake ware collection. Made of pure aluminum, these premium pans produce evenly browned baked goods every time. Rims are reinforced with galvanized steel to prevent warping and aluminum will never rust. Making meat loaf has never been healthier or easier! perforated aluminum trivet allows fat to drip away as meat bakes. Handles on trivet make it easy to live contents for serving without sticking. 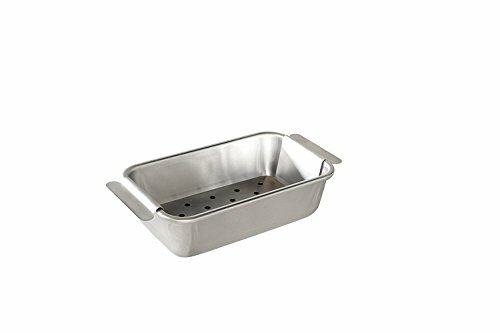 Loaf pan doubles as a bread baking pan too. If you have any questions about this product by Nordic Wares, contact us by completing and submitting the form below. If you are looking for a specif part number, please include it with your message.